Brain Damage - What You Gonna Do ? 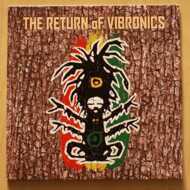 Vibronics new album is crammed to capacity with bass heavy sound system dub. From the roots of orthodox reggae right through to the far reaches of new UK bass music culture, The Return Of Vibronics is a no-compromise dub mission. This time Vibronics have hooked up with some proper JA reggae heavyweights, in the form of King Tubby/Yabby You legend Michael Prophet and Mad Professor microphone don Macka B, as well as contemporary UK talents including the Scottish firestorm MC Soom T and Leicester vocal luminary Madu Messenger. 12 brand new tracks of pristine vocals, militant instrumentals and intense dub mixes.